Alex Duncan is a mother, a sister and the daughter of a doomsday prepper. She always thought her father was insane, but when a plague hits the United States and the dead no longer stay dead, Alex discovers heeding her deceased father’s advice is what will keep her family alive. Before he died, Alex’s father created a compound in Montana just in case situations like this arose. Living in a highly populated city like Las Vegas makes the reality of the plague imminent to Alex. With little time to spare, Alex must make split-second decisions to prevent her family from being devoured. As the outside world crumbles and grows darker, Alex faces adversity from the dead and the living. Government assistance is nowhere in sight, and rumors fly that the nation’s only solution to the growing plague is execution. Will Alex be up to the challenge, or fall, and rise again as one of the undead? 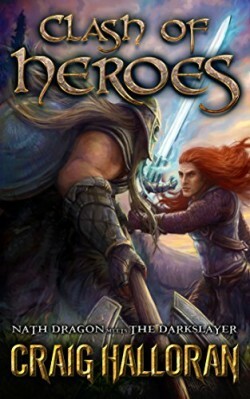 After the fearless hero is banished to another realm, Nath has no recollection of his past. Trapped in a dark, deadly, and devastated world, Nath is bound in servitude to the evil underlings who use their arcane powers to force Nath to kill their vile enemy, the Darkslayer. As he sets out, Nath walks a dangerous road, uncertain of who his true enemies–or allies–are. With nobody to trust and unable to find his way home, Nath is in for the fight of his life. In this clash of the titans, will Nath uncover the truth of the powerful Thunder Stones in time or be stranded in a perilous world forever? Nath finds an ally in Venir in his quest to search for a way home, but the world of Bish, it’s harsh elements and it’s nefarious people won’t make it easy. Oran the underling Cleric has sought the assistance of Collo the Gnoll and his manhunters to hunt down Nath Dragon and The Darkslayer. But the underling Lords Catten and Verbard don’t think that will be enough. They imbue Oran with some of the nastiest underlings hunters of all. Realizing that he is putting new friends and allies in danger, Nath decides to go it alone and enters the eerie and unpredictable Red Clay Forest where he is never heard from again. It’s up to the Darkslayer to find Nath before the dark forces that chase him close in. Can Venir find Nath in time? Or will Nath’s pride be his undoing? As leader of the Vampire Enforcement Agency, Roric’s job is to find and capture the vamps who betray humans’ recently-earned trust. Until one human woman tempts him to break all the rules. When Roric intercepts a rogue vamp attack and finds Caroline dying, he can’t resist her blood or her beauty, and in a moment of passion he does the unthinkable. But Caroline despises the monsters who killed her parents, and she’d rather die than be a vampire. With vamp attacks at an all-time high and Caroline resisting him at every turn, Roric’s job, his family, even his life is at risk. Worse, Caroline’s attacker wants her just as bad as Roric does, and he knows Roric’s secret. Roric will do anything to earn Caroline’s trust, but can he keep her safe long enough to convince her that life as a vampire isn’t a death sentence? A ancient power has been discovered in the depths of the Darkwoods that could destroy the entire land of Thac. Enter the maniacal Princess of Lanfor, armed to the teeth in a flying fortress. With an army of dragons at her command, has she come to claim the Thrall Master’s deadliest secret? If so, will the young heroes be able to stand against the might of an entire nation? In the mountain city of Dwim-Halloe, Eidryn and Elvar were born twins to teachers at the city’s revered School of Magic. When the new king outlawed magic, the boys’ parents were murdered. Their deaths forfeited the twins’ magical birthright and made them homeless fugitives. In the frozen world of the Frost, only mysterious blue flowers that bloom in the snow keep the monsters at bay. Lia follows the rules of the village: Don’t talk to outsiders. Don’t go into the Frost at night. Don’t ask too many questions. Rules keep her family alive. But when her sister finds a handsome fugitive bleeding to death in the forest, Lia surprises herself and does the unthinkable. Giving shelter to the fugitive could get her in trouble. The Elders have always described the advanced society of people beyond the Frost, the “Farthers,” as ruthless and cruel. But Lia is startled to find that Gabe is empathetic and intelligent…and handsome. She might even be falling in love with him. But time is running out. She has to get Gabe to safety.